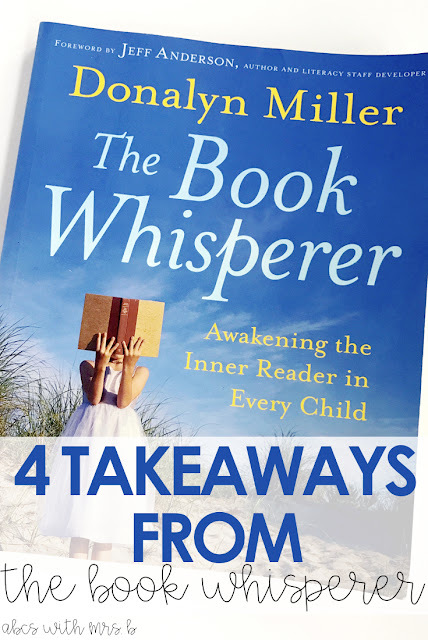 This is not a sponsored post by any means, but I had to share some take aways from The Book Whisperer by Donalyn Miller. It was one of the best professional development texts I have read in my 7 years of teaching. It's a quick read with a lot you can do right away in your classroom. Here are a few of the takeaways I got from the text that I'm implementing now! Kids pay attention! If you show them your love for reading, students are going to recognize that and it could possibly get them engaged in reading as well! If you don't love reading, fake it 'til you make it ;) Honestly, I never thought of myself as a reader growing up. I don't think I even considered myself a reader for a good chunk of my 20s. Then I started reading young adult fiction so I could try to get my students hooked. Well, I got hooked. Now, I love young adult literature way more than adult literature. I find that I can read the books faster (I'm not the most patient person) and that's okay! Showing kids that you love reading can definitely make a difference in their lives as well. They literally may not see this in any adults they know. I started to read young adult fiction to see which books I could read with my students. It turns out I started loving it. Because of this, I can now recommend some great texts to my students. However, after reading The Book Whisperer, I realized I have to keep going and open up my horizons a bit. I LOVE realistic fiction - Wonder, Fish in a Tree, Because of Mr. Terupt - I could read them all day! What I realized is that I don't have many fantasy or mystery texts to recommend to my students. My next goal is to try these out! If I don't like them, so be it! It's okay if I put them down, but if I don't take risks in my reading, my students won't either. Speaking of book recommendations, Donalyn Miller is a big proponent of this. Now, I thought in previous years that I was doing this, but not to the extent that I should. I created this Student Survey you can grab for free to get my students thinking about themselves as a reader right away at the beginning of the year. These surveys are also going to be a great way for me to find tons of books that I think my students will love right away! Additionally, I need to give students the opportunity to share texts they love with their peers! Having tons of recommendations at their finger tips will more likely give them more motivation to pick one up and dive in! One of my favorite things to do as a teacher is read a book aloud to the class and really enjoy it with them. I love hearing their reactions and their questions while they get hooked in the text. One thing I realized I need to do is lay off the formal, unnatural way my students are responding to the text like completing a worksheet or written a response where I'm looking for just the right answer. I want to change this up for the coming year. Of course I'll use the texts to teach important literary concepts such a plot, setting, character, etc. However, now I want those lessons to be built in the discussion and experience of the text rather than some packet or book report that needs to be completed. Okay, so those are just a few of the fabulous things that I'm getting started with right away. There is so much more amazing information in the text and can be applied to any grade level or class! I would highly recommend reading The Book Whisperer by Donalyn Miller right away! I always love a good student interest survey! 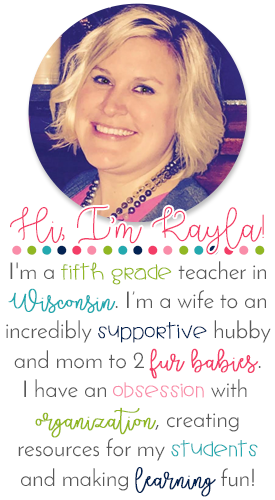 I usually give them out at the beginning of the year to get to know more about my new students in my classroom! Here are a few ways I use them, plus you can grab the Student Interest Survey I created HERE! It's great to get to know your students likes, dislikes, interests in and outside of school and their personality (which can really shine through these surveys). I love going through these together as a class before administering them so students know the importance and it shows the students how I really want to get to know them as much as possible right away! Using these as a community building opportunity is pretty great too! Students can share out their answers and find others with similar interests. It's a great way for students to get to know each other as well. Students can also feel a sense of pride in who they are, as well as start having some conversations about struggles to foster growth mindset. If I know a student is really into Star Wars, I might use that to guide some of my instruction, especially if I'm working one-on-one with a student. It makes their learning a little more exciting (hopefully ;)). After reading The Book Whisperer by Donalyn Miller, I realized using these surveys is the perfect way to recommend books for students - particularly those reluctant to read. If I know students are really into sports, I'm going to find as many sports books as I can that are quality texts to get in their hands right away at the beginning of the year! 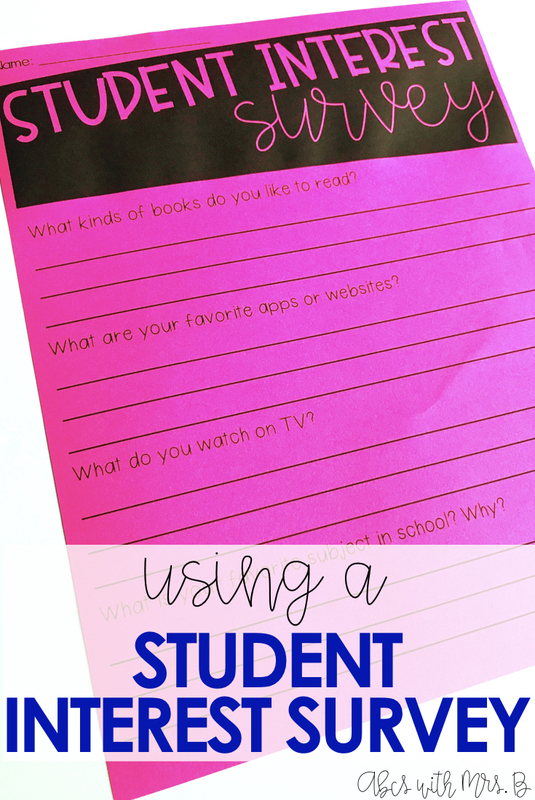 Do you use student interest surveys with your students? How do you use them? Don't forget, grab the Student Interest Survey for FREE HERE!